The Apollo 8 crew, consisting of Command Module Pilot Jim Lovell (1928-), Lunar Module Pilot William Anders (1933-), and Mission Commander Frank Borman (1928-). John F. Kennedy Space Center in Merritt Island, Florida, on December 21, 1968. Apollo 8 was the first manned spacecraft to leave Earth's orbit and the first to orbit another celestial body, the Moon. Apollo 8 returned to Earth on December 27. Original color photographic print: Private Collection of Dr. Calvin D. Fowler. "APOLLO 8 CREW." Smithsonian National Air and Space Museum. 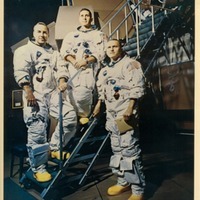 http://airandspace.si.edu/explore-and-learn/topics/apollo/apollo-program/orbital-missions/apollo8-crew.cfm. 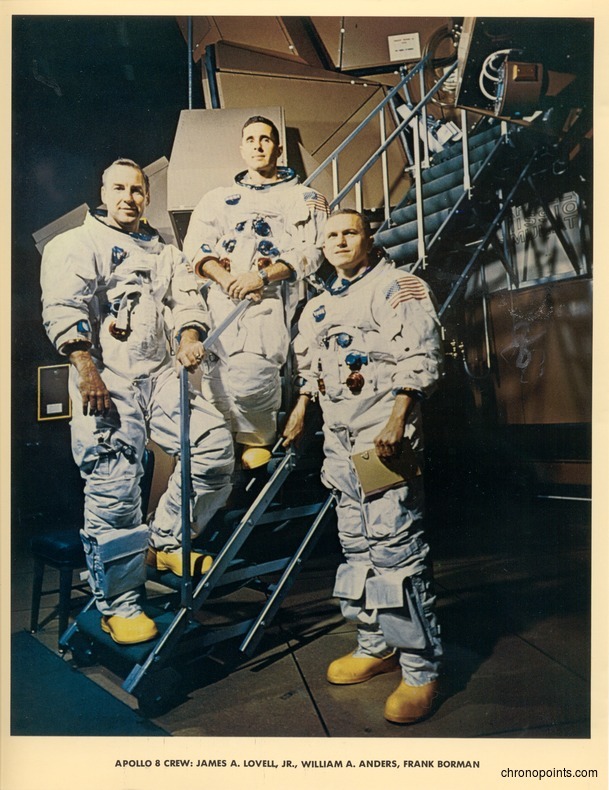 “Apollo 8 Crew: James A. Lovell, Jr., William A. Anders, Frank Borman.” RICHES of Central Florida accessed April 26, 2019, https://richesmi.cah.ucf.edu/omeka/items/show/6408.